Lanark Agricultural Centre has a wide variety of versatile and adaptable areas for all kinds of events. On the upper gallery is the Symington Suite which is ideal for seminars, training days or meetings. We can arrange the suite in a range of seating styles to suit your function and are able to accommodate up to 120 guests seated theatre style. The room is also popular as a venue for smaller parties, wedding receptions and formal dinners; perfect for a gathering of around 100. The Main Concourse is in great demand for larger parties, wedding receptions, Club functions and fundraising events and dinners. 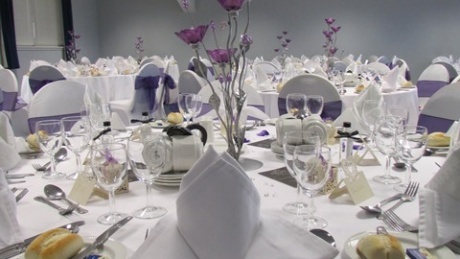 The spacious surroundings enable us to cater for anything from a small buffet for 100 to a seated formal dinner for 350. The General Hall is a multi-functional area which benefits from lots of natural light. It is well established as an ideal venue for dog shows, trade shows and indoor car boot sales. There is ample free parking both at the side of the hall and an additional 500 parking spaces at the front of the Centre. For further information please contact William McCulloch on 07836 505762 / 01555 662281 or complete the booking enquiry below. A formal booking form can be found under the Entry Forms section of the website.